Yes, it is possible! It can be done with a new kind of currency. It’s an idea that has been brooding in my mind for about a year now and recently the final puzzle piece fell into place. I’ll start with a short introduction to our current state of affairs and then I’ll lay out the goals to be achieved before diving into describing how money can work differently. For those who want to dive in immediately, skip to ‘Clearing the mind‘. Probably no one disagrees with the fact that there is a lack of availability of money. I don’t think there is a government in the world that doesn’t have debts they just can’t seem to get rid off. Poverty is getting worse, especially in developed countries, and the money there is seems to pool in the pockets of the happy few. In short, our current money is created out of debt, mostly by banks. On that debt there is interest, which means that more money has to be paid back than has been created. Now there is also an interest on the money you keep in your accounts. As long as the total interest that is generated by money in accounts equals the interest payable on debts, there is no problem. This is explained in detail by Steve Keens. However, the reality of today is that average Joe pays more interest on his loans than he gets from the money he has in the bank. It’s only when you start to have really big piles of it that you have a chance of getting a bigger return than the interest you pay on your loans by speculating on the financial market (this is not money created by interest on bank accounts though, so where does it come from?). This creates a huge incentive for hoarding and that is a big problem we are facing. The hoarded money, which is mainly circulating in the financial market, is essentially outside of the economy we live in day to day. Economies thrive when money circulates, but slow down when it is hoarded. This speed of circulation is called the ‘velocity of money’ in economic circles. The higher the velocity, the more economic activity, the more value is potentially created with the same dollar (if we just pass it around in a circle, no value is created). Right now we seem to have two economies, the financial one for the wealthy and the one we live in. And money seems to be flowing mainly from our economy to the financial one. The conclusion is: the current scenario is far from ideal. For a longer explanation on how our money works, have a look at the Positive Money website. 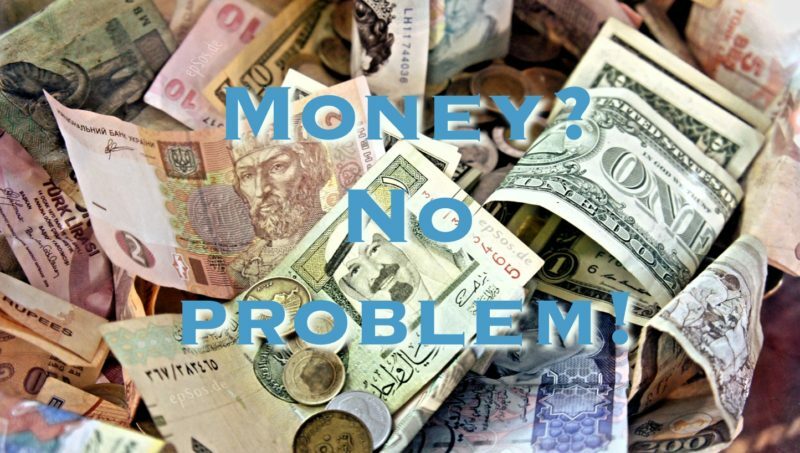 Before diving into the thick of this new monetary system, I would like to invite you to temporarily set aside any assumptions you have about money. Feel free to collect them again at the end of the article. Ready? Ok, here we go. 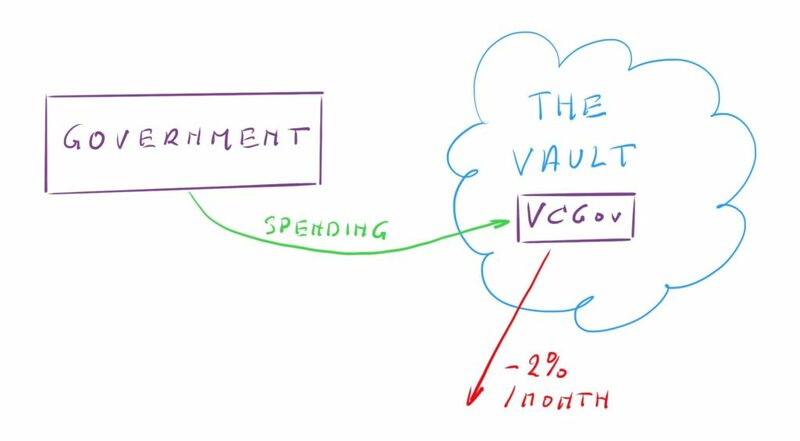 The currency system is called ‘the Vault’ and the currency is a VCoin. This article is proposing a new cryptocurrency built on the blockchain (a public, encrypted ledger for securely registering transactions) or something similar. The blockchain already underpins BitCoin and many other cryptocurrencies. It eliminates fraud and facilitates a monetary system that does not have to be owned by a central entity. This then avoids or at least diminishes abuse of the monetary system by people aiming to gain power. To be clear, this currency does not use BitCoins and it does not work the same way BitCoin does. 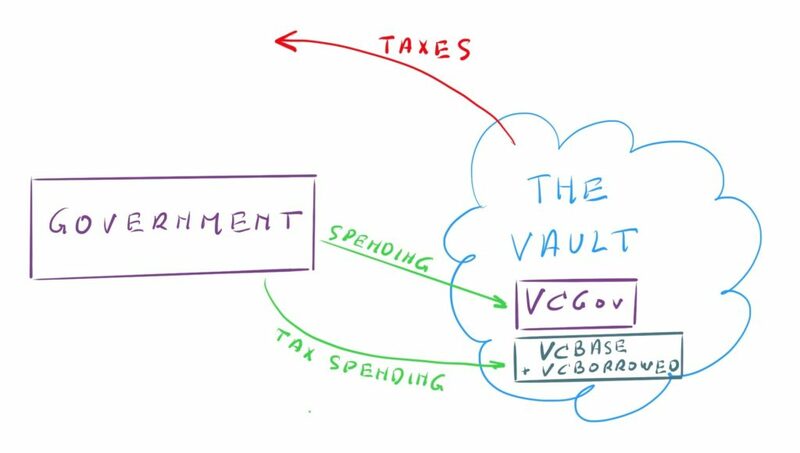 Let’s call the monetary system ‘the Vault’ and for the sake of this article, the currency itself VCoin. Total amount of VCoins in circulation, which is called VCTotal. Total stable amount of VCoins in circulation, which is called VCBase. 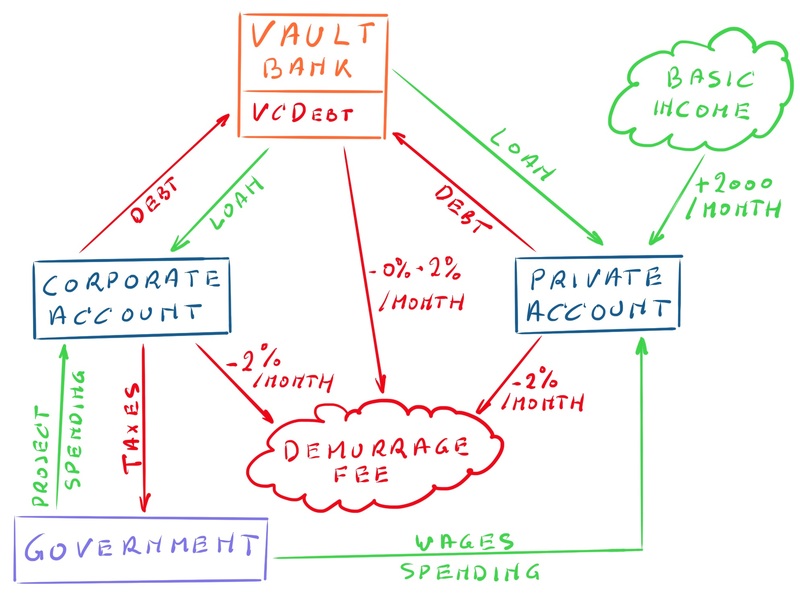 The Vault Bank from which money can be borrowed. Total amount of outstanding loans, which is called VCDebt. The borrowed money, which is called VCBorrowed. Everyone gets an account with 100,000 VCoins. Everyone can open one and only one private account in the Vault. 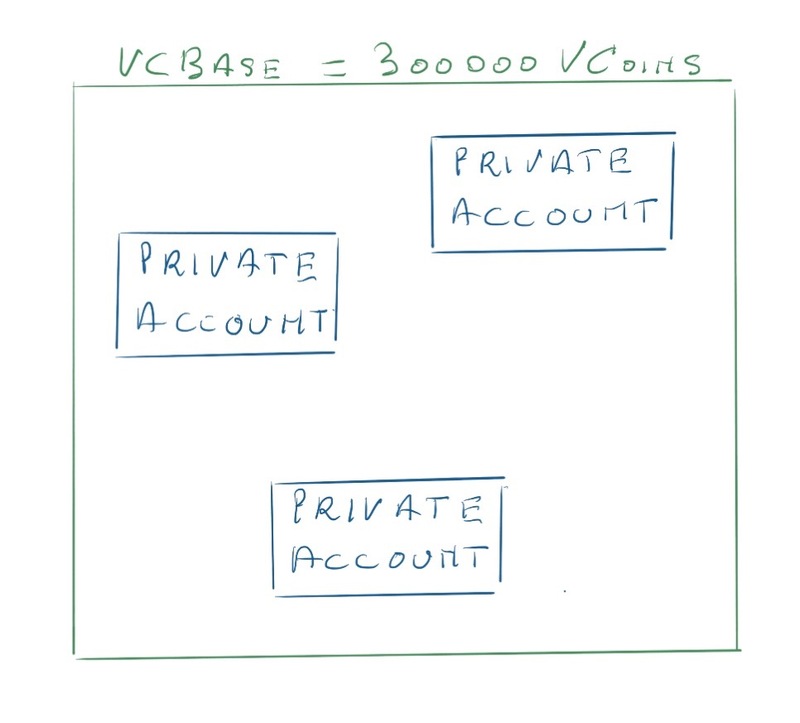 Every private account, when opened, will have a balance of 100,000 VCoins. This is newly created money. It sets up the initial amount of money that is available for spending. 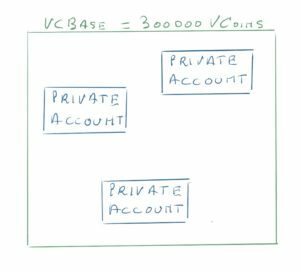 With this setup VCBase = 100,000 x number of private accounts. Everyone receives a basic income of 2,000 VCoins per month. Every month 2,000 VCoins are added to each private account. This is a fixed basic income. Every month 2% is taken off every account. 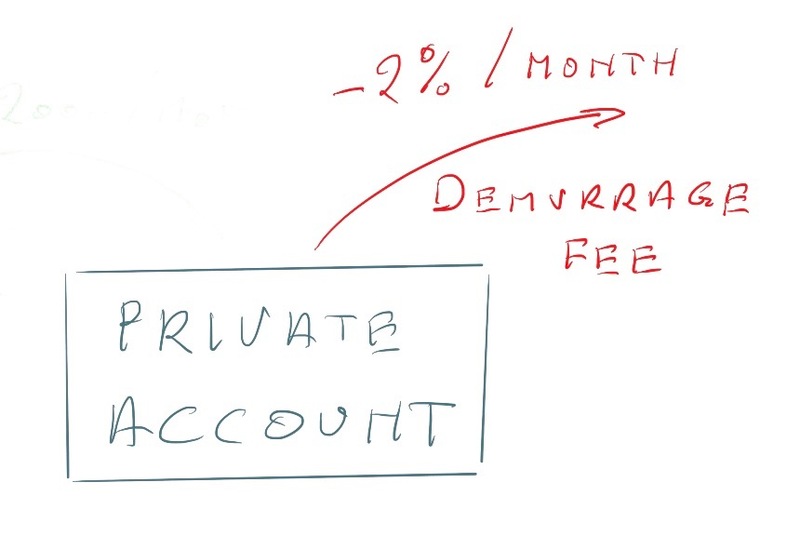 At the end of every month, 2% is taken off the account (calculated on the average balance of the account over the month). This is defined as a demurrage fee in economics. The amount collected this way is destroyed. The demurrage fee disincentivises extreme hoarding since the more someone keeps on an account, the bigger the cut will be at the end of the month. This increases the velocity of the currency. 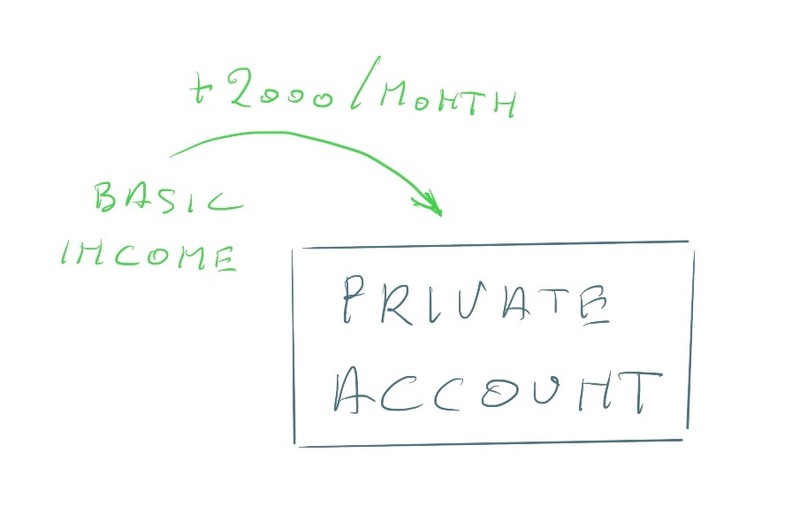 Note that the basic income equals 2% of the initial deposit when opening an account. This choice is made for simplicity reasons. Negative balances are not allowed. Negative balances are not allowed. This is not as big an issue as it might seem because loans are interest free. See below under ‘Lending and borrowing money‘. Closing an account removes 100,000 VCoins from VCBase. The account balance is exactly 100,000 VCoins: in this rare case the account is closed and the money on it is destroyed. The account balance supercedes 100,000 VCoins: 100,000 VCoins are taken out and destroyed, the rest of the money goes to the appointed beneficiaries, after which the account is closed. The account balance is below 100,000 VCoins: the account is closed and the money that was on it is destroyed. The missing amount will ‘leak’ out of VCBase because of the demurrage fee. Say the balance was 60,000 VCoins. That means the remaining 40,000 VCoins are on other accounts. These 40,000 VCoins are subject to the demurrage fee but the equivalent is not re-injected through the basic income because there is one fewer private account to put it in. This way the 40,000 VCoins will eventually leak out of VCBase. Accounts are only really closed when someone dies. Otherwise they are set to inactive. This is to avoid people closing down accounts when they are depleted and reopening them again in order to claim another 100,000 VCoins. A secure identification system would be needed to avoid fraud but that topic is outside the scope of this article. An inactive account is still subject to the demurrage fee and still receives its basic income of 2,000 VCoins every month. Eventually the balance will reach 100,000 VCoins, no matter what it was when it was inactivated. If the owner decides to reactivate the account, he regains access to the balance on the account at that point in time. Corporate accounts do not receive an initial balance, nor a basic income. They are subject to the 2% demurrage fee. There can be as many corporate accounts as people want. 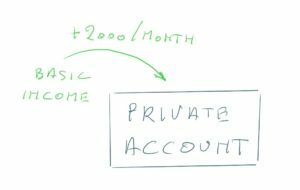 Corporate accounts work slightly different in comparison to private accounts. They are subject to the 2% demurrage fee but do not receive the initial 100,000 VCoins and they do not receive the basic income. When corporate accounts are closed the balance can either be distributed to designated private accounts or it can be set to inactive, which will result in the balance eventually reaching 0 due to the demurrage fee. The demurrage fee creates an incentive for interest-free lending since the lender can safeguard her capital against the demurrage fee by lending it out. Say that I have 300,000 VCoins in my account and I am spending 5,000 VCoins a month on average. And you have started project for which you need 250,000 VCoins. I would be more than happy to lend you those 250,000 VCoins without interest for a monthly rate of 4,000 VCoins. Now I am only paying 1,000 VCoins in demurrage fee (2% of 50,000) per month instead of 6,000 VCoins (2% of 300,000). This gives me an income of 6,000 VCoins per month minus the 1,000 VCoins in demurrage fee, which leaves me with a net income of 5,000 VCoins. Enough to cover my living expenses. And that is when I don’t have any other income. 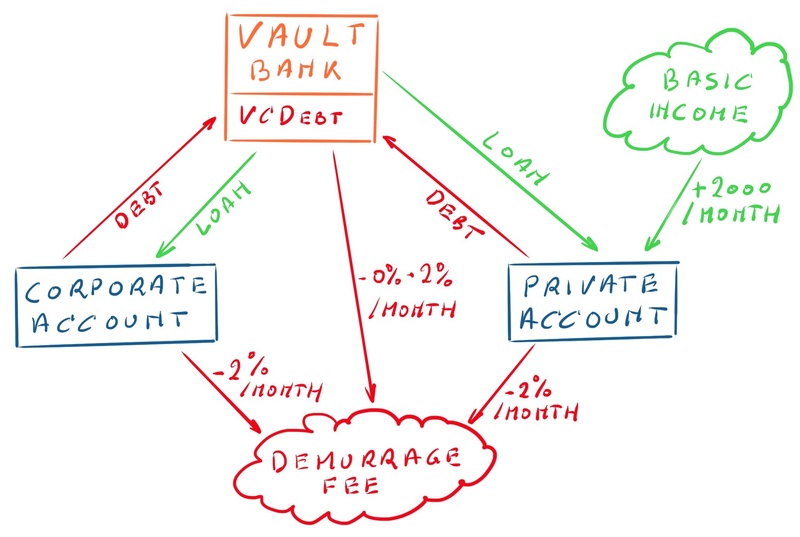 In case no private lender can be found, a loan can be made from the Vault Bank, also interest free. This is new money, VCBorrowed, that is added to VCTotal. It is also subject to the demurrage fee. Let’s call the amount that is taken out of VCBorrowed by the demurrage fee VCVoid. One of 3 options can be taken. VCVoid is re-added to VCTotal. 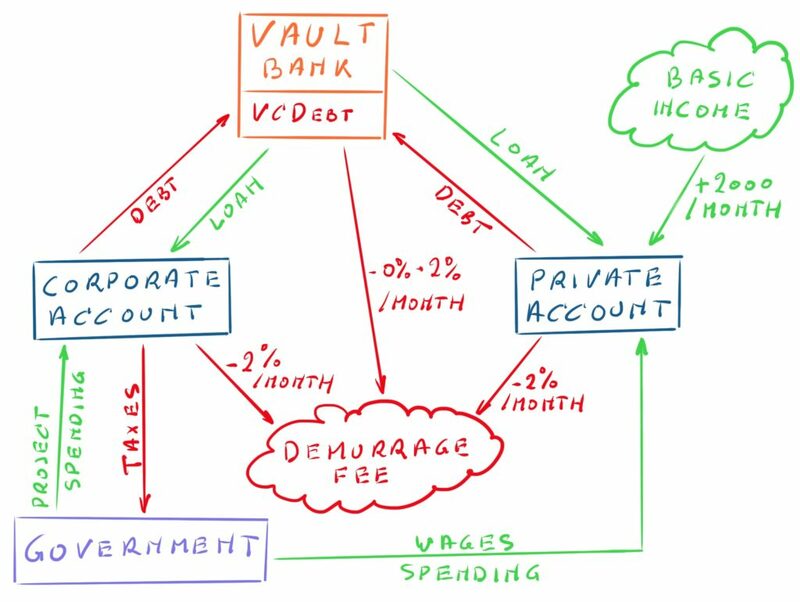 This immediately restores the balance between VCBorrowed and VCDebt, making sure there is enough money in the Vault to pay off the debts. This is difficult to implement because the only option we have available is adding it to the basic income. That would create an incentive for lending with the intention to raise one’s basic income, something that would lead to out-of-control inflation and is better to be avoided. VCVoid is subtracted from VCDebt. This also restores the balance between VCBorrowed and VCDebt. The effect of this is that loans are made with a negative interest-rate equal to the demurrage fee. This creates an incentive for borrowing from the Vault bank in order to fund projects. At the same time it disincentivises private loans, thereby further disincentivising hoarding as a side effect. Nothing is done with VCVoid. Now there is an imbalance between VCBorrowed and VCDebt, namely VCBorrowed < VCDebt. This means that in order to pay off the total debt, money from VCBase needs to be used. In the long run that is not a problem because as soon as VCTotal drops below VCBase, the sum of all the demurrage fees taken out of all accounts would be less than the total sum of all basic incomes added to VCTotal, bringing it back towards the initial VCBase. Which option is chosen depends on the incentives we want to create. Option 1 is not a smart choice, option 2 would create an investment-friendly environment where risk-taking is encouraged while option 3 would make people more cautious before they start taking out loans for their projects. It’s even be possible to create a mix of options 2 and 3, thereby playing with the impact of the different incentives. For example, loans could have a 1% negative interest, thereby depleting VCBorrowed slower than the demurrage fee would do with option 3 while at the same time creating some caution when people borrow money for their projects. Relentless borrowing could de-stabilize the system. The question needs to be asked why people would do it though. Is there enough incentive? Our current monetary system would also suffer with out-of-control borrowing and safeguards have been set up. The same can be done for the Vault. The details of these are beyond the scope of this article. It is easy to build variations on this. The initial balance on personal accounts can be varied, the basic income can be varied and the demurrage fee can be varied. Varying these parameters over time while the system is in use should be done with care and side effects need to be taken into consideration. 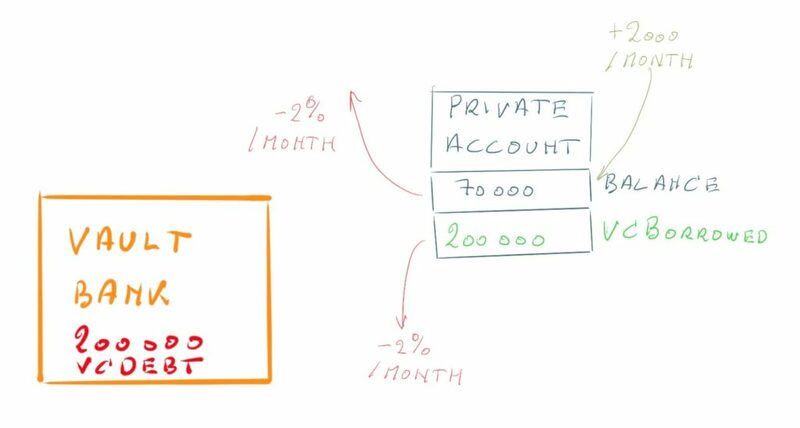 So, if a basic income of 5,000 VCoins is chosen, together with a demurrage fee of 1% and an initial deposit of 10,000 VCoins per private account, the balance of each individual account, when left alone, will eventually end up at 500,000 VCoins. This creates a stable VCBase that scales with the population while borrowing adds money that scales with economic activity. This would add complexity but would further disincentivise extreme hoarding. Calculating the exact impact on VCBase is beyond the scope of this article. Predicting everything is hard but I think that the positive impact would far outweigh any negatives that would pop up. And no system is ever perfect, the goal is to create a better one. What about the government and taxes? By now you might be wondering: and where do we make taxes obsolete? I decided to keep that one for last because in order to get there we need government involvement. At first sight this might create an out-of-control inflation but it won’t because there is a built-in safeguard. Say that government spends 1 billion VCoins a month. The first month this happens, VCGov would equal 1 billion VCoins. At the end of the month though, these 1 billion VCoins are subject to the 2% demurrage fee. This amount is destroyed along with the rest of the collected demurrage fees. The first month, 20 million VCoins are destroyed this way. Every month this amount will go up until it reaches the monthly amount spent. With a government spending 1 billion VCoins every month, inflation stops as soon as 50 billion has been spent into existence, taking the monthly demurrage fee into account. At that point, 1 billion VCoins will be destroyed every month due to the 2% demurrage fee, the same amount that is re-spent into existence. Government is now released from the burden of balancing the books and can focus on implementing projects for the public good. Higher spending automatically means higher economic activity and lower spending means lower economic activity. That way government spending is on par with the size of the economy which is created by government spending. When big, expensive projects are finished and less money needs to be injected, the surplus will leak out over time due to the demurrage fee and less money being created each month. Government is no longer dependent on tax income because they can just spend the necessary money into existence. Therefore, taxes are no longer needed to run the country. It is best to add these taxes back to VCTotal in order to avoid large fluctuations in VCTotal. The worst case scenario is when collected taxes are higher than the total sum of all basic incomes. This would make VCBase shrink. It is really easy to avoid this. In all cases it can be injected through government spending, thereby effectively turning taxes collected on unwanted behaviour into benefits for the public. And it has a dampening effect on the temporary inflation created by VCGov. Tax income will undoubtedly diminish over time. But with government not reliant on taxes that’s not a problem anymore. The only problem that could arise is that government has too much tax income, i.e. when it can’t spend it all back into the economy. Not a situation I think will easily happen but even that could be easily rectified by lowering taxes. The Vault is currently only an idea, it has not been implemented yet. In the best case scenario we have government working with us. Now that Japan has recognized BitCoin as a valid currency this might even happen. But it can also be done without government involvement. We’ll still have to pay taxes in that case though. We only need a group of people to implement the Vault in order to start using it. Since the launch of the Ethereum platform we have the tools to easily make this happen. Then we need a community that is willing to use it. In the end, money is based on trust. And with the blockchain a platform can be created that is trustworthy. The setup parameters (initial deposit, demurrage fee, …) can be tweaked so that it scales with that community. Transparency is needed. That means that if you have an account, everyone can see that, but not the balance on it. By having an account you automatically accept the currency, at least as a percentage of payment for your services and/or products. That percentage can grow when the user base grows. The more services and products that can be traded with the currency, the higher the trust and the more people will be willing to accept it as payment, growing the user base and adding ever more products and services. This platform can easily run in parallel to our current monetary system … until it takes over. You can call me crazy and a dreamer but the world has never been changed by ‘realists’. I know I’m not the only one who has been thinking along these lines. And with all the financial scandals being uncovered and the uprise of grassroot movements of people who have had it with the status quo, I believe the time is ripe to take back the biggest power tool on the planet: the monetary system. Here you can find an interactive model that allows you to play around with some of the parameters and which simulates the effects on a personal account. Ok, you can now collect your assumptions about money again if you still want to. Two things I thing could/should be addressed through currency is Healthcare and Education. For education, I figured people can be given a similar initial deposit (I thought $200K) of ‘Educash’ (working title), only able to be accepted by registered education providers, at an imposed limit of $5 per hour of educational interaction. The education providers could then convert that into Vcoins for spending in the ‘normal’ economy. This is based on the inherent assumption that education is a public good, and that more educated people are good for the community, regardless on what jobs people have at the end of it. I take it you’re counting on the government to spend vCoins into existence in the right places (such as education/healthcare)? Yes, I was basically assuming that government would now focus on spending in the right places. To make that happen the political process needs to be changed but that is beyond the scope of the article. Also, several dedicated currencies could be introduced next to a general one. These could either be based on the same principle or work differently. The currency described in this article does not exclude the existence of other currencies. Great ideas, Mr. Kuypers, dear Stef. I am not economist or a professional in the social science discipline of economics. I’m just a polytechnician and civil engineer, but I could follow your reasoning … more or less. looks great and promising. The greatest inventions of mankind were the result of positive dreams. What would become of the human race without those dreams? Het lijkt me (zie FB) dat er al een en ander op stapel staat. I fully support your endeavor and ideas and will read more about them. Perhaps I could help you somehow? Ja, ik heb inderdaad contact met Gunter en ben reeds in gesprek met hem hierover. Ik ben ook nog andere geïnteresseerden aan het contacteren. En ben zeer benieuwd naar jouw verdere input. Misschien eens samen een koffie gaan drinken?